JACKSONVILLE – The Jacksonville Sharks kick off their season at home for the first time in their 10 year history as a franchise this Saturday in the Shark Tank. Following an impressive training camp the Sharks trimmed their stacked roster of talent which boasted All-NAL stars, former NFL players, returning arena veterans, impressive rookies, and a range of talented players coming from other leagues proving that the Sharks got a little bit of everything going into this season. After falling one game short of the championship and losing their title as NAL Champs the Sharks, led by head coach Siaha Burley have a lot to prove in 2019. After reviewing each team in the NAL, it’s hard to argue against what the Sharks have put together this offseason. Developing a championship roster relies on depth at key positions and building strength in areas that were former weakness. 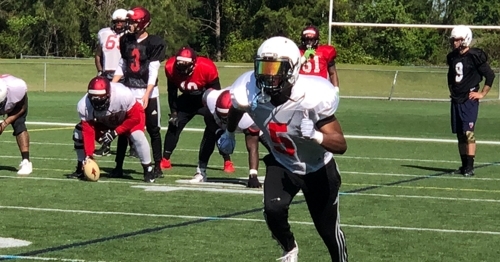 Finishing training camp no team in the National Arena League appears to be more poised for a championship year better than the Jacksonville Sharks. In addition to gaining top arena football players, the Sharks did an excellent job forming strong football coaching staff featuring former Maine Mammoths Head Coach James Fuller (Sharks Defensive Coordinator), Lee Johnson (Sharks Assistant Head Coach/Lineman Coach) a 20-year veteran coach who spent time coaching in both the CFL and the AFL. The Sharks even found a coach from within the franchise by hiring former All-NAL Linebacker Charlie Hunt (Director of Player Personnel/ Special Teams Coordinator). The Sharks look to have a dominating season to celebrating their Decade-long success as an organization in arena football. The spotlight of most teams rosters are at the QB position, the Sharks are no exception; gaining two young quarterbacks who both played in the AFL during their careers. Jonthan Bane who had an impressive season in 2018 with the NAL’s Maine Mammoths. Mike Fafaul a former UCLA product, played for the AFL’s Albany Empire last season behind former Sharks legend Tommy Grady. The biggest improvement the Sharks made this year was at the receiver position. After finishing fourth in the league in passing game, coach Burley snatched not one, not two, but the top three receivers in the NAL from the 2018 season Jarmon Fortson (Columbus), Devin Wilson (Maine), and Durron Neal (Columbus). Burley built an offense this year that will feature three All-NAL receivers, a quarterback that led Maine to a six-game win streak to finish the season and solid Offensive Line led by First Team All-NAL lineman Derrick Ziegler. On paper the Sharks don’t appear... They prove to be the top team in the NAL going into the season but until the final whistle blows on Saturday night Shark nation won’t we really know how this new Sharks team will fair against the brand new expansion team the New York Streets. What we do know about the Sharks roster is that it has certainly turned heads around the league including big names in the National Arena League including the Commissioner Chris Siegfriend and Orlando Predators Owner Kenny McIntyre both agreeing Jacksonville looks to be one of the toughest teams to face this season, “Stacked” was one of many word used by the rival Orlando Owner when referring to the Sharks roster. In the media realm the Sharks were dubbed #1 in the NAL Preseason Poll by “Inside The Arena” that predicted Jacksonville and Massachusetts to be the two best teams to finish the NAL season with Jacksonville on top. Check out the full Jacksonville Sharks roster below or visit: www.jaxsharks.com/team/roster/ to see more information on each player. Come see the Sharks face the New York Streets this Saturday Night for KISS night. Tickets are on sale for as low as $10 in honor of the Sharks 10th anniversary, come celebrate the Sharks Decade of Dominance. Going to the KISS concert Friday night? Bring your concert ticket Saturday and get $5 off any Sharks tickets for Saturdays game. Call: 904-621-0700 or visit: www.jaxsharks.com/tickets/single-game-tickets/ .